As a regular theatre goer I’m often asked by friends what plays and musicals I’d most like to see a production of… not the shows I just haven’t had a chance to catch but the ones that don’t really get to see the light of day. Somehow in the past year The Union Theatre has managed to tick two off from right at the top of the list. Last year’s The Fix and now my secret passion, the musical I have always wanted to see… Blondel! I’ve carried a torch for Tim Rice & Stephen Oliver’s madcap musical since I acquired a copy of the original cast recording as a child. It was a legendary flop but listening to the glorious music I could never quite understand why. Perhaps, in the early eighties this witty, silly show didn’t stand a chance against the overblown Lloyd Webber juggernaut or the coming tide of Boublil & Schönberg’s melodramatic masterpieces. Thankfully, in the cosy confines of the Union and the capable hands of Sasha Regan the show has absolutely flourished! Regan uses her space wonderfully and has assembled a superb ensemble who embrace the silliness and revel in the multitude of winks to the audience. Connor Arnold is excellent as the titular bard who is desperate to find fame with his music. Arnold plays to the audience excellently, oozes charisma and has a lilting, light vocal that marries excellently to the tunes. It’s a shame that, due to the limitations of the venue, he’s occasionally drowned out a little by the band, but for the majority of the show he more than holds his own. His take on the charming Least of My Troubles at the end of act two is pitched perfectly! Neil Moors as Richard, and cast. Phot by Scott Rylander. Blondel’s passion for his music is only matched by his love for Fiona, a washer woman in the King’s court. Jessie May revels in the role, a fiery feminist butting heads with medieval gender roles. 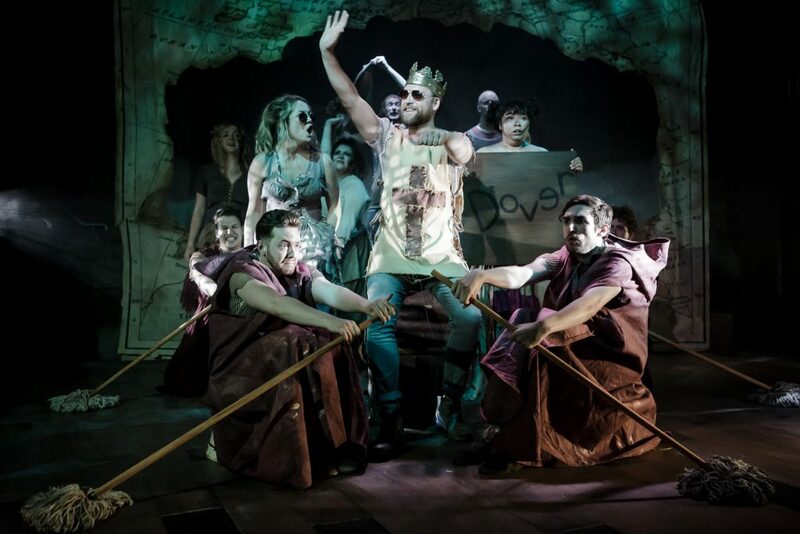 She plays brilliantly off of Neil Moors’ slightly self-absorbed King Richard, a brash, macho monarch who gives her a chance to see the world by carting her off to the Crusades to wash the gore off his boots. Moors revels in Lionheart but comes into his own in Saladin Days lamenting his capture and remembering all fun he had at war. 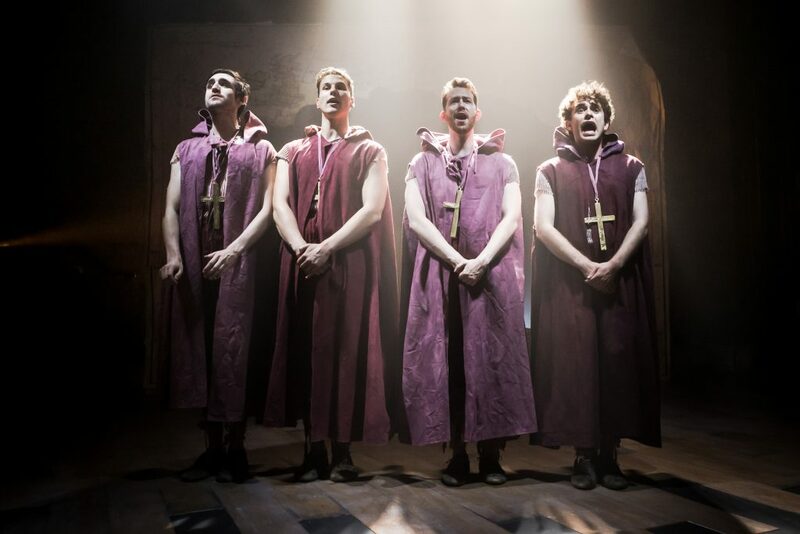 The real stars of the show though are a quartet of monks who sing in perfect harmony and handily appear at regular intervals to tell us what on earth is happening (and to usher us out in the interval to top up on tasty beverages). David Fearn, Ryan Hall, Oliver Marshall and Calum Melville are a well drilled team and masters of both close harmony and facial expressions that would make Kenneth Williams or Charles Hawtrey proud. Sure the piece isn’t perfect, it bimbles along at a leisurely pace before a sprint to the finale and there are probably five minutes or so of repeated tunes that could be trimmed, but producers Donald Rice, Aaron Rogers and Sasha Regan have crafted a hilarious chamber musical that seems more relevant, funnier and simply more enjoyable than I can ever imagine it being way back in 1983. 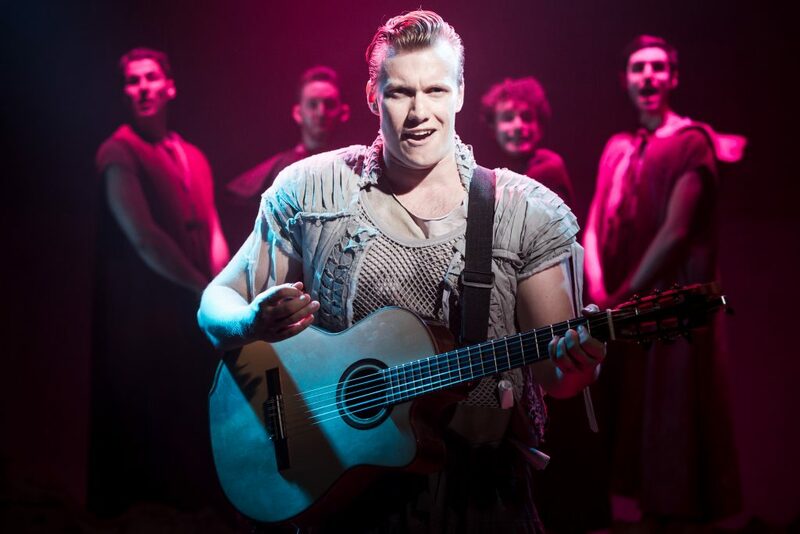 I sincerely hope there’s life for this production beyond the confines of the little Union stage – as Richard says, Blondel’s story will live on through the ages! At The Union Theatre until July 15th. Go to http://www.uniontheatre.biz/ for more info. I was just enquiring whether you’ll be reviewing at the Edinburgh Fringe this year and I could try and tempt you to review one of our season – we’ve got 5 musicals going to the fringe this year. Let me know – as I wouldn’t want to bombard you with Press Releases if you’re not. Thanks for finding us. Unfortunately we won’t be in Edinburgh this year. Hope it all goes well though!